Why is the Democratic Party losing white voters, which was quite evident in results of the 2014 mid-term election when Republican candidates made gains in both houses of Congress? White voters of all ages were less likely to back Democrats this year than in elections past, helping Republicans nationwide but most acutely in the South - and overpowering Democratic efforts to turn out their core supporters among blacks and Hispanics. In a nation growing ever more diverse, political forecasters repeatedly warn Republicans they must improve their appeal among minorities in order to remain competitive in the long term. But for the Democrats, dominating the vote among minorities isn't enough to win elections today - and it won't be in the future if the GOP is able to run up similar margins among whites, who still make up a majority of voters in every state. "The rule of thumb was Democrats could win with 90 percent of the African-American vote and 40 percent of the white vote," said Merle Black, a political science professor at Emory University in Atlanta. "But now very few Democrats could think about getting 40 percent of the white vote. They're trying to get 30 percent. In the Deep South states, from South Carolina to Louisiana, it's very hard for the Democratic candidate to get 25 percent of the white vote." Republicans running for seats in the House won 60 percent of the white vote, while Democrats won the backing of 89 percent of African-Americans and 62 percent of Hispanics. Those margins are nearly identical to the 2010 midterm elections. But Democrats won more of the white and Hispanic vote in 2006, the last midterm elections in which the party won control of the House. White voters last tilted in Democrats' favor in a midterm in 1990, and were a swing group in the 1980s. The data on voters come from exit polls of voters nationally and in 27 states that were conducted for The Associated Press and the television networks by Edison Research. Most interviews were conducted among randomly selected voters at precincts nationwide and in each state. 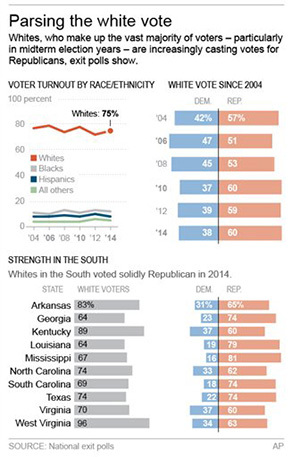 Outside the South, whites broke for Republicans by an average of 8 percentage points on Tuesday. But in 10 Southern states with an election for Senate on the ballot, Republicans won the white vote by an average of 42 points. Democrats garnered so little support among whites in Georgia, Louisiana, Mississippi, South Carolina and Texas that a majority of those voting for the Democratic candidate were non-white. In North Carolina, though incumbent Democratic Sen. Kay Hagan was widely credited with running a solid campaign, she carried just 33 percent of the white vote - down from 39 percent in 2008 - and lost. White voters under age 30 backed Hagan by close to a 2-1 margin six years ago as they helped sweep President Barack Obama into office. This time, in a midterm election, the younger white voters who cast ballots in North Carolina broke just as decisively for Hagan's Republican opponent, state House Speaker Thom Tillis. Steve Rosenthal, president of the Organizing Group, a Democratic-leaning consulting firm, said he's been jokingly calling this election the Seinfeld election for Democrats: They had no national message that resonated with their voters. "It was an election about nothing. Republicans made it an election about President Obama. That was their goal," he said. "Their mission was to turn out people who were angry, people who were displeased with the job the president has done." It was a mistake for Democrats to distance themselves from the president, said Erik Smith, a former Obama campaign adviser and Democratic strategist. Democratic voters are not motivated to help candidates who were happy to be with Obama two years ago, but tried to avoid his presence this year, he said. "I'm sure (it) led a lot of these voters to say, 'How is this candidate going to treat me in two years?'" he said. The only states in which Democratic Senate candidates improved their overall support among whites were Minnesota, Oregon and Mississippi, a Southern state where Travis Childers managed to grow the Democratic share of the white vote from 8 percent in 2008 to 16 percent. Democratic voters were especially less engaged in states where there were not supposed to be competitive elections, said Michael McDonald, an associate professor of political science at the University of Florida who tracks voter turnout. Democratic voters are traditionally more likely to stay home if the midterm races are uninspiring, while Republican voters - who tend to be older, wealthier and more educated and also are more likely to be white - generally come to the polls anyway, he said. "The poster child for this would be Virginia. It's an uncompetitive race, according to all the polls. In that environment, who sits out the election? It's predominantly Democrats," McDonald said. Two days after the election, while the heavily favored incumbent, Democratic Sen. Mark Warner, had a lead of a few thousand votes out of more than 2 million cast, the race remained too close to call. Associated Press writers Connie Cass in Washington and Bill Barrow in Atlanta contributed to this report. Follow Jennifer Agiesta on Twitter. I don't have much to say on this issue, but voting is a voice for the people. Our government has been democrat heavy for a while now. Why are they losing white voters? Look at the direction the country has been going in the past few years. There is an obvious change that needs to be made. Finally, voters are educating themselves and voting for the correct set of ideas. White or not, people are tired of the hand-me-downs, etc. What do you mean exactly by hand-me-downs? I believe what you are trying to say is that people vote for a political party just because that is what they have always done instead of actually looking at the issues that both discuss. Do you think people are starting to do this? We also have many minorities in the country that may be swaying these votes. I think it is important to vote how you choose and how you see fit. With this being said there are many news channels that are biased and making your judgement based on just one news channel is probably not the best. My mom has told me to go look at several news channels, newspapers to get a fair knowledge of it all. If you are going to vote for a certain party because you are influenced by your parents or that's what you always vote, I don't really believe in that. I think politics should be based on an individual thoughts. go mom! she has educated you on how to make a right decision. news stations lie to. I think that at the end of the day it is someone's personal opinion in why and who they vote for. But in saying that this country has had some major issues the past years is right. I think white voters may have seen this negative change and started to educate themselves better on the parties they are supporting. Whites have become more prosperous over the past 50 years and income still correlates with Republican voting habits (for Hispanics, non-Hispanic whites and, to a lesser extent, African Americans). Moreover, Democrats’ decision to embrace policies aimed at their “coalition of the ascendant” cannot be viewed in a vacuum. The Democrats’ stance on immigration isn't particularly popular among whites, and whites, especially whites without college degrees, have shifted toward Republicans, resulting in no net change. Many voters today are uninformed and rely solely on the stupid ads run by politicians. many white voters only paid attention to their candidate because he or she said they are going to get rid of Obama and didn't pay their vote any more thought.Secondly I know for a fact many people vote against democratic the democratic party just because of our president, our president should not sway your opinion on your senator, governor or any representative. I definitely agree that people may be voting Republican just because they dislike Obama. The problem is, Obama won the election and will be our president until 2017, and voting Republican will not change that. It would be terrible if people grouped all Democrats together and judged them just because of Obama, but I think that is what is happening here. No political party should be judged because of one politician. This happens a lot in politics when one politician helps everyone think negatively or positively about that entire party. The minorities are voting one way where the whites vote another way typically which I think has always happened. I think if someone is interested in elections, one should educate themselves in all aspects and vote accordingly. An opinion on how you view the world's issues can usually link you to one party or another but so many people assume they are one party because of one event or one law. Knowledge at that time is very important. In this topic, do not follow the bandwagon or the trend, do what you think is right. Think for yourself. I think that every person should educate themselves and vote for themselves. I think that race plays a huge role in why Obama is in office today and that is something that people just got on the bandwagon with. They didn't educate themselves on what Obama was bringing to the table and how he was going to help our country. I agree that race plays a huge role in why Obama is our current president. I remember an interview I saw when Obama was first running for president. African-Americans were being asked whether or not they were going to vote for Obama. Most said they were, even though the interviewer said that Sarah Palin would be the vice-president. Those interviewed obviously did not educate themselves on Obama's campaign because it was obvious that Palin was not campaigning. The only conclusion I could make from the interviews was that some African-Americans were voting for Obama just because of his race. I think that people are unsatisfied with what Obama has done in office, therefore they are educated themselves on what type of party they want in office and realize that the republican party will bring more to the table for what they want in a president instead of the democratic party. Obama just made them realize what each party stands for and wants for this country. I think white people are starting to vote for the republican party because they finally started to do research on the parties and did not like what the democratic party stood for and was offering and promising once they got into office. I think Obama has shown the white party that it is not what they want in a president. In saying that I think that they have listened to the campaigns and are now siding and supporting the republican party because the country is in need of major changes and the democratic party is not offering those changes. I think that overall a lot more people are switching parties, it is not just white people. Everyone is not stuck once they choose a party. If you do not like what your party is choosing to do you have the right to switch. Democrats may be concerned about the white vote, but at least they don't actively seek to disenfranchise whites. On the other hand, Republicans are doing everything they can to keep non-whites from voting, whether with strict voter ID requirements, strict proof of citizenship requirements, lifetime felon disenfranchisement laws, limitations on early voting, limitations on provisional balloting, limitations on voting by mail (except for the military, natch), limitations on immigrant naturalization, etc. All of which hinder non-whites more than whites. This though shouldn't be something to discuss. It's one country and there shouldn't be types of classes of voters. White, hispanic, black, etc are all Americans.